For the more than 10,000 companies in the solar industry, business is booming. Massive companies like Apple and Google have installed solar panels on their campuses. Most states offer some form of tax incentives for commercial and residential installations—on top of the 30 percent federal tax credit everyone already receives—so consumers and companies have plenty of reason to go solar. And the Solar Energy Industries Association reports that there are now more than 1.9 million individual solar installations in the US. Since installing solar panels on your home or campus is such a significant investment (well upwards of $10,000), and there are so many regional and local solar installers, it shouldn’t come as a surprise that consumers and companies turn to Google to research their options. That’s where EnergySage comes in. When people search for information about pretty much anything related to solar panels, they’re almost guaranteed to run into EnergySage in the search engine results pages (SERPs). If you Google “how much do solar panels cost,” EnergySage is the first thing you see. Same with “solar batteries,” “solar tax credit,” “solar panels for home,” “solar panel efficiency,” “diy solar panels,” and numerous other search queries that have both high traffic and high purchase intent. Searches like these naturally guide consumers from research to purchase. These are the things every solar-panel installer should be educating their audience about, and regional installers should be fighting tooth and nail to rank for these keywords. But when it comes to search engine optimization (SEO), EnergySage is dominating all things solar. 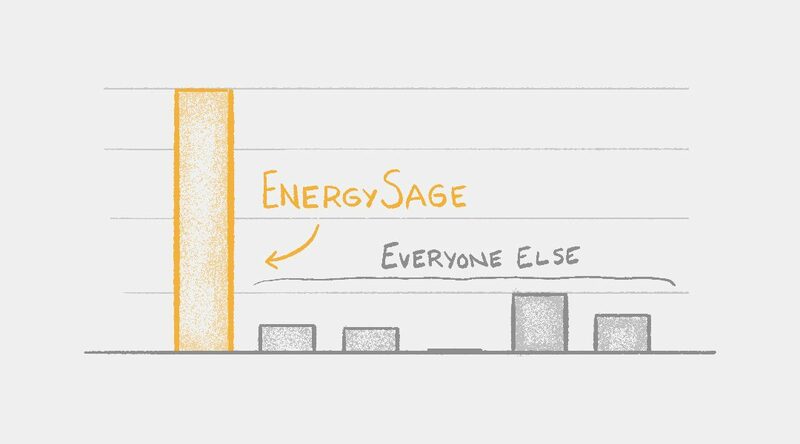 EnergySage gets about 615K organic views every month—several times more than the largest solar installers in the country. If you wanted to buy that traffic with ads, you’d need a multimillion dollar advertising budget. Ahrefs estimates the value (what you’d have to pay to get it through PPC) of EnergySage’s traffic is about $2 million per month. And Google just hands that traffic to them. And get this: EnergySage doesn’t even install solar panels. But wherever you live, EnergySage gives you quotes from companies that do. They’re the definitive online marketplace for solar-panel installation. But as robust and helpful as their comparison shopping tools are, that’s not why people turn to them. People looking to buy solar panels wind up on EnergySage.com to research, and EnergySage provides a natural path from that research to purchase. SimilarWeb estimates that more than 80 percent of the traffic on EnergySage.com comes from search. And no, those aren’t people Googling variations of “EnergySage.” Branded search only accounts for about 5,500 monthly visits—less than 1 percent of their organic traffic. People hit Google when they want to research solar, wind up on EnergySage.com, then get competitive quotes from installers in their area. And it’s costing solar installers a lot of sales. Solar installers could tap into that organic traffic themselves, but instead, they pay EnergySage for referrals and slash their prices to compete against other installers. On EnergySage.com, an installer’s entire pitch is reduced to price, warrantees, and a handful of other factors. Instead of investing in content and building their own streams of organic traffic, more than 500 installers around the country pay EnergySage for leads. And in order to get more leads, those installers have to compete head-to-head with their competitors. That might sound like a win for everybody involved, but solar panel installers—especially the largest ones—are forfeiting leads by letting EnergySage send people to their competitors. And EnergySage customers are really saving money because installers have to gouge their prices to compete. And in that way, EnergySage is the Amazon of solar panels. Not to mention, solar installers are losing opportunities to pitch their other home energy solutions or explain the nuances of their specific offers. If a solar installer were getting all that organic traffic, they could highlight a range of products that reduce energy costs and increase efficiency. Instead, EnergySage directs all of that traffic to whichever local installers give the most competitive quotes on solar panels. The largest regional solar installers (several of which serve more than 20 states) are the ones who have the most to lose here—because local installers can often provide more competitive offers. They’re also the best positioned to do something about it, because they can afford to invest more in content. The biggest names in solar installation should be trying to beat EnergySage on SEO. Despite being built around one of the hottest innovations in tech and the future of energy, the vast majority of solar companies are lagging behind when it comes to content marketing and SEO. Several of the top solar-panel installers in the US don’t even have blogs. And their “education” pages are . . . light. This forces their leads to do independent research on other websites (like EnergySage), and greatly reduces the likelihood that their target audience will find them on Google. Furthermore, many of the installers who do have blogs are stuck on the content calendar treadmill, cranking out posts on topics that have a tenuous relationship to solar and don’t have a prayer of generating organic traffic—let alone the right organic traffic. They recognize that content is important, but they’re struggling make it work for them. So, what should they be doing? Just take a look at EnergySage. They have 35 blog posts that Ahrefs estimates are worth more than $10,000 every month—including two worth more than $100,000 a month. They have thousands of posts—but about 20 percent of their traffic comes from 10 of them. We’re going to look at EnergySage’s most valuable pages and talk about why they work, how much traffic they pull in, and how solar installers can beat (or at least compete with) them. Some of their top-performing blog posts live on News.EnergySage.com, and some come from the resource center. We’re going to focus on EnergySage’s posts that have the highest estimated value, regardless of where they live. However, I’m ruling out most of EnergySage’s review pages and “best of” posts. Those are harder for solar installers to compete against because EnergySage can look at brands and products as a “neutral third party,” and most installers probably aren’t willing to risk sending traffic to their competitors. I also ruled out some redundant content so that I can give you the most helpful tips. The “estimated value” you’ll see comes from Ahrefs—one of the best SEO tools out there. Ahrefs estimates how much traffic Google is sending to a page based on what keywords it ranks for and where it stacks up in the SERPs. Then Ahrefs multiplies that traffic by the current cost per click (CPC) you’d be charged for advertising for those keywords. And voila. You have an estimate of how much a page is worth. Oh, and keep in mind: this is the estimated value per month. I’ve included the main keywords these posts rank for because it isn’t always clear—and it gives you a better idea of what you can do to beat them. You don’t necessarily want to model your posts after EnergySage—you want to create content that does the best job of answering the questions your target audience is asking. Together, these 20 posts represent about 25 percent of EnergySage’s total organic traffic and about 31 percent of the value of their total traffic. Note: I used Ahrefs to collect this information between March 15 and March 21, and the estimated traffic and value may have fluctuated since then. So without further ado, here are EnergySage’s 20 most valuable blog posts. 1. How Much Does the Average Solar Panel Installation Cost in the US? Competitive tip: EnergySage does a good job covering most of the basics. This post has helpful dynamic tables and graphs, and links to other helpful content. But this post could be organized better, and it doesn’t spend much time getting into the variables that affect the cost of an individual installation. This should lead with the average cost (which they do) and immediately give an overview of all the factors that impact cost, then dive into each of those factors in more detail. Someone skimming this page would have a hard time figuring out what all the variables are. And of course, this content can naturally lead to a free custom quote. Not to mention, this post has a ton of comments (more than 100), and EnergySage doesn’t really monitor them or respond to questions. You could mine their comment section to find out what they’re not addressing, then work that into your post. Competitive tip: The part of this post that actually digs into the solar tax credit is pretty brief. (The generic “tips for solar shoppers” section is almost as long.) Right now, the Federal ITC is one of the biggest tools solar installers have to create urgency. The longer people wait, the less benefit they’ll be eligible for. This is a prime opportunity for installers to thoroughly explain how the tax credit works, what it is, and why it makes this the best time to go solar. EnergySage also links to a separate page about how to actually claim the solar tax credit, and several articles that go into more detail. Any and all relevant information about the tax credit should definitely be incorporated into a single pillar page, even if those topics are also worth having separate pages for. You don’t want to make people hunt for the things they’re looking for. Also, the URL for this post is /congress-extends-the-solar-tax-credit. Going with a more evergreen URL string like “/solar-tax-credit” will give you a marginal leg up on EnergySage. Competitive tip: This is basically a FAQ page, which is helpful, but it doesn’t really cover the entry-level information you’d expect to find if you Googled “solar panels for home.” A comprehensive post that leads with an introduction explaining what residential solar panels are, how they work, the major types (and what they look like), and why you’d want them would have a good shot at beating this page. 4. Tesla Solar Roof Cost vs. Solar Panels: Worth the Premium? Competitive tip: EnergySage has the right idea by suggesting scenarios where you would or wouldn’t want to go with a Tesla Solar Roof, but it’d be good to also flesh out the reasons why someone would want one—even if only so that you can pick those reasons apart. A solar panel installer also has the benefit of being able to provide their own average cost for “regular” solar panels. This type of comparison page is extremely valuable, because it’s one of the first things people see when they Google “Tesla Solar Roof,” and it satisfies what people are looking for while nudging them toward your product. In fact, the announcement of Tesla’s solar roof might be the first time someone has even considered solar. Ranking for this topic gives installers a chance to educate and inform these new shoppers on the breadth of solar options they may not have known existed. Competitive tip: EnergySage has the edge when it comes to comparison shopping, but they don’t spend much time on general information about efficiency. A page about solar panel efficiency should cover what it is, why it’s important (or why it’s not in comparison to other factors), and ultimately showcase the efficiency of your particular panels. Competitive tip: This post ranks #1 for “solar batteries,” but it doesn’t really explain what solar batteries are or why someone would want them. It’s helpful for someone who’s already decided they want solar batteries, but it doesn’t help someone decide if they should get them. Basically, it’s written for someone who’s already shopping for them, but a post like “the beginner’s guide to solar batteries” could easily climb ahead of this post if it’s thorough enough. This is a topic most installers should have a pillar page on, explaining the basics of solar batteries and getting into why someone should or shouldn’t invest in them. 7. “Free Solar Panels”: Are They Really Free? Competitive tip: In addition to ranking #1 for “free solar panels” (which gets 2,800 monthly searches), this post ranks on page two for “solar panels,” which gets 181,000 monthly searches. While that SERP is dominated by pages where you can actually shop for solar panels, there are currently two pages that simply talk about them. As for “free solar panels” in particular, this is something installers should address whether they have a free solar panel program or not. If you do have one, you definitely want to make the case for them and provide counter arguments to the points in this post. And if you don’t have them, this post is a good model for how you can educate your audience about why they should avoid these programs. Competitive tip: This post hits all the right points, but it could definitely spend more time unpacking how to get each rebate or incentive, and an overview of how they all work together would be helpful. You could also use a post like this as a pillar page, using each incentive as a topic cluster. This post doesn’t explain the time-sensitive nature of a lot of these incentives. People researching solar should know that these benefits are on track to go away or decrease in the future. For a solar installer, this would also be a great place to promote any special offers or unique incentives your company has. This is basically your opportunity to walk people through exactly what you will do after they contact you (which you should encourage them to do at the bottom of the post). You want them to come away with a clear understanding of how everything works and why they should rely on your expertise. An infographic would be a great way to supplement the information in a post like this. This post could also go into tips and mistakes to avoid when installing solar panels, to further educate readers and meet search intent. Competitive tip: For a post that ranks #1 for “diy solar panels,” this is incredibly brief. EnergySage lists five steps to DIY your solar panels, but doesn’t walk you through that process. Someone Googling “diy solar panels” is probably at least as interested in learning about how to actually do it as they are in learning about the pros and cons. Looking at the pros and cons is helpful, but a thorough post like “DIY Solar Panels: The Complete Guide” would be more helpful—while still giving you plenty of opportunities to talk about potential risks and reasons to use an expert. This topic could really benefit from an infographic or video (or even a video playlist), too. 11. Should You Buy or Lease Your Solar Panels? Competitive tip: This post is mostly bullet points. That makes it simple to skim, but it also means it’d be easy for a solar installer to write something more comprehensive. It’d be helpful to go over the pros and cons of each scenario, and ideally explore a situation where someone might want to lease their solar panels so they can understand the process better. Alternatively, you could take a hard stance and explain why purchasing is always better. This could really use an infographic, flowchart, or quiz, too. That would give people another way to process the decision and apply your insights to their own situation. Competitive tip: This post is titled like a news article, which means when people find it in Google, it may not look like a list of incentives and tax credits (which is what people are looking for). Even with similar coverage of all the programs, someone could outrank this post if it was presented as an overview or guide to all California solar rebates. Every solar installer should have a pillar page covering the incentives in each of the states they service, and this is a decent model for how to do that. 13. What Is Solar Energy? There are plenty of ways to use this topic to naturally lead people into your marketing funnel by encouraging them to learn more about solar panels. Oh, and you should definitely use an infographic for this one. Competitive tip: This is another example where the search intent is clearly to actually shop for solar panels, but EnergySage has proven that people are also looking for help shopping. An installer could write something like “Solar Panels for Sale: The Complete Shopping Guide,” or, if you’re bold enough, you could create a comparison page to help people decide between you and your biggest competitors. Of course, if you offer a variety of panels, this is a good place to explain the differences between them as well. Bonus technical tip: This is an example of a page that takes advantage of the fact that your main headline (the <h1> tag) and your page title (the <title> tag) don’t need to be identical. The title is what appears in SERPs, while the headline is what people read on the page. EnergySage optimized the title of this page for clicks from search engines—notice some of the differences between what you see in the SERPs . . .
15. Are Solar Panels Really Worth it? EnergySage covers a lot of the related questions, but I’m sure there are more. It also doesn’t touch on non-financial reasons to invest in solar panels, and the section on “what if it’s not sunny where you live?” could definitely go into more detail. An infographic would also be a helpful way to illustrate how someone would decide if going solar is worth it. 16. How Do Solar Panels Work? Competitive tip: This guide covers the science of solar panels fairly well, but could definitely benefit from some more “high-level” consumer-friendly language. Your customers shouldn’t need a college degree to understand your product—which is why the “how do solar panels work for your home” section could really use some expansion. Each of those steps deserves a more thorough explanation. And of course, an infographic would make this much easier to understand. 17. The Pros and Cons of Solar Energy: What Are Advantages and Disadvantages of Going Solar? Competitive tip: EnergySage keeps their list down to five pros and five cons. Your team could probably come up with more and turn it into a listicle. Something like “20 Pros and Cons of Solar Energy” could have a great shot at outranking this post. Competitive tip: This is EnergySage’s pillar page on solar energy. It’s thorough. It links out to tons of more specific solar-related content. And pretty much every page that talks about solar links back to this hub. (Ahrefs says there are more than 1,700 internal links to this page!) This post is already on the first page of Google when you search “solar energy,” but I wouldn’t be surprised if it continues to climb, and it could possibly reach #1. The main opportunity to outdo EnergySage on this one is to create a better visual guide (such as an infographic and/or a video). Also, currently this post spends a lot more time talking about using solar power than explaining what it is. If you want to do a better job meeting search intent, I’d recommend addressing more of the basic questions surrounding solar energy before getting into a pitch for solar panels. Competitive tip: This is basically just a list of ways solar panels are being used, and the latest innovations in solar panel tech. What EnergySage has here is helpful, but this page would do a better job meeting search intent if it didn’t just list “new” solar tech and if it had images (not just icons) showing each piece of tech in action. There’s also room for this post to explain some of the advantages solar has over traditional energy sources and why moving to a renewable energy source like solar is important and already possible. 20. How Many Solar Panels Do I Need for My Home? Competitive tip: Obviously, there are a lot of factors that can affect how many panels someone needs. EnergySage doesn’t get into all of them, and that’s definitely what people are expecting to see here. It’d be really helpful to have a quick overview of those factors upfront in addition to the average number of panels people need. In the months and years to come, I suspect EnergySage will dominate the solar SEO space even more—unless installers make some big moves to beat them. EnergySage has covered A LOT of ground with their content, but it’s not unbeatable. You also don’t have to beat them to replicate their success. There’s room for more than one content powerhouse in solar SEO. Here’s how you can climb ahead (or at least keep up). Alternatively, this is also how EnergySage could tighten their grip on the SERPs. EnergySage does a good job communicating with people who already have some familiarity with solar and are seriously considering a purchase, but even their entry-level material can be a little too dense for the average consumer. They have the expertise, but they could work on making it more beginner-friendly. One of the best ways to make complex concepts more consumable is with visuals, like infographics and videos. EnergySage has plenty of videos, but infographics would definitely improve these pages, and anyone that wants to compete with them should try to create more visually compelling content. When it comes to ranking in Google, thorough content tends to win. EnergySage has some pretty lengthy posts that cover a lot of the questions consumers have about solar-related topics. But some of their most valuable posts are also pretty sparse. They leave questions unanswered. Or they list steps without explaining them. Take the time to flesh out everything your audience should know about a topic, and if there are steps, walk them through it. If you’re competing directly with one of EnergySage’s posts, make sure you check their comment section to see if people were looking for something else. Since EnergySage doesn’t respond to comments or update posts based on them, you can fill those gaps. Not sure how to make your post more comprehensive, or how to decide how long it should be? Check out this guide. Some of EnergySage’s content almost appears to accidentally rank for major solar keywords. It only meets specific aspects of what your audience is looking for. And looking at the titles and URLs (like on the solar tax credit post), it doesn’t look like they initially set out to write something that ranks. In general, if you’re writing a post that you want to rank for a keyword, that keyword should be the only thing you put in the URL (for example, YourWebsite.com/blog/solar-tax-credit). It may not seem like a big deal, but in terms of SEO, there’s a big difference between Blog.Website.com and Website.com/Blog. The former puts your blog on a subdomain, the latter puts it in a subdirectory. Subdomains negatively impact your rankings. EnergySage could be even more dominant if they consolidated their content on EnergySage.com/solar or EnergySage.com/blog. And if they don’t, that leaves their rankings more vulnerable to an SEO-savvy solar installer. EnergySage is already well ahead of anyone else creating content in the solar space. But they’re far from unbeatable. With smart SEO and content marketing, there’s no reason why solar installers can’t take back the SERPs and start earning their own free leads—instead of relying on EnergySage’s table scraps. If you have a team that’s dedicated to creating content right now, it’s time to focus on quality, not quantity. Create the resources that do the best possible job educating your leads and customers about solar. And produce content that provides what people are actually looking for. Even if you aren’t worried about trying to rank for all things solar, EnergySage is modeling what every installer should be doing: educating their audience. When people come to your website, they should be able to do all the research they need—or else you’re asking them to go somewhere else, like EnergySage, where they may wind up buying from your competitors. Sound like more than you can handle right now? We just tore down the biggest brand in solar SEO, and we’re happy to help—as consultants or your new content team.